The Battle of Walawbum was an important military victory of Republic of China's armored force during WWII. Now let's take a look at the true story of this battle. In the first half of 1942, the Republic of China Army assigned an expeditionary force to attend a joint operation with the Commonwealth of Nations to hold off the Imperial Japanese Army’s invasion of Burma (modern-day Myanmar) . Unfortunately, the British had made up their mind to give up Burma and instead defend India, their only remaining colony in the Far East and an important base of operations. The British garrison offered the invaders little resistance, and the first expedition resulted in failure. General Joseph Stilwell, the chief of staff of the China Burma India Theatre and the commander-in-chief of the Chinese expeditionary force in Burma (as assigned by Chiang Kai-shek), ordered the expeditionary force headquarters, the new 22nd Division of 5th Army, and the new 38th Division of 6th Army to regroup in India. Focused on regaining control of Burma, and having the authority to utilize Lend-Lease materials from the United States, Stilwell combined the new 22nd Division (commanded by Liao Yiao-xiang) and the new 38th Division (commanded by Sun Li-jen) to form the new 1st Army (commanded by Zheng Dong-guo), which received equipment from the Unites States and supplies from the Unites Kingdom. A training center was established in Ramgarh, India, and the expeditionary force was trained by advisors from the United States Army. Later, this became the Chinese Army in India. Following the training, it would wait until the time was right to strike back and open a passage to Ledo Road. In order to obtain more officers and specialists for their newly mechanised army, General Hsu Ting-yao, the dean of Mechanisation School, suggested that Chiang start an armour training unit with equipment and training from the Unites States Army. This was the beginning of the modernisation of the Republic of China Army. The suggestion was recognised by the Chongqing government and Stilwell. Following the establishment of the United States Army's Armour School in India, the Republic of China Army Mechanisation School and Armour Training Unit in India was also established for personnel management. It was planned for the school to provide training to 6 armoured battalions, but only the 1st and 2nd Armoured Battalions were constituted, and only the 1st Armoured Battalion engaged in battles. The 1st and 2nd Armoured Battalions were under the command of Colonel Rothwell H. Brown, the armour commander of the Army in India. The 1st Independent Armoured Battalion was established in July 1943. The battalion chief was Colonel Zhao Zhen-yu, and the deputy chief was Major Zhao Zhi-hua. The battalion was ready for battle when it received vehicles from the United States at the end of December 1943. The battalion was deployed with 56 M3A3 Stuarts, 17 reserve tanks, more than a hundred CCKW 2½-ton cargo trunk and tens of ¾-/¼-ton command trucks. The battalion organisation included the headquarters and HQ company, 3 armoured companies, a supply company, and the medic squad. Each of the three armoured companies came equipped with 17 M3A3 Stuarts. Each of the three platoons was given 5 tanks, with the remaining 2 tanks directly assigned to the company. After receiving the vehicles, the battalion received mechanical training from a 44-member group from the United States 527th Ordnance Company (heavy maintenance) (tank). As most units completed training in October 1943, Stilwell sent a regiment of the new 38th Division into the Hukawng Valley jungle to distract the Japanese force from the American and Chinese sappers working on Ledo Road. This was the beginning of the offensive. However, the commanding HQ misinterpreted the information and underestimated enemy strength, so the battle was much harder than expected. Reinforcements were sent several times, until eventually the completely green 38th Division was on the frontline. At that time, the Japanese Army had deployed 6 strong infantry divisions in Burma. Northern Burma was under the control of two regiments and had the field artillery support of 18th infantry division (commanded by Lieutenant General Tanaka Shinichi). The new 38th Division, with several waves of reinforcements, engaged in fierce battles at Yubong Ga and Taihpa Ga. A regiment of the new 22nd Division, which had not initially been included in planning for the operation, had to be sent to the Taro Plains to drive the Japanese away. Due to the slow progress in the Northern Burma campaign and the appearance of the main force (the IJA’s 18th infantry division), Stilwell was determined to send additional forces to neutralise the 55th and 56th regiments, the backbone of the enemy division. 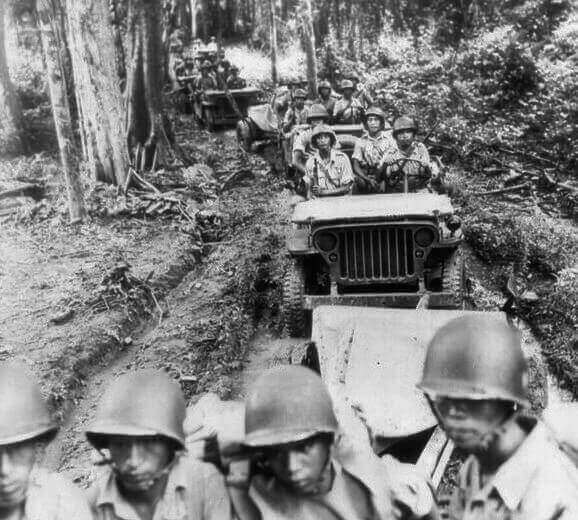 The additional force included the 5307th Composite Unit (also known as Merrill’s Marauders), the United States' long-range penetration special operations jungle warfare unit under the command of Brigadier-General Frank Merrill, and the 1st Independent Armoured Battalion that just completed basic vehicle training. Upon receiving orders at the end of December 1943, all personnel of the 1st Independent Armoured Battalion reached Kolkata by train before relocating with the vehicles through the newly completed Ledo Road to reach the battlefield in Northern Burma. This was a challenging trip: these crews, who had just completed basic training, had to drive through highly challenging, newly-cut mountainous paths of questionable robustness, which seemed to be an impossible task. 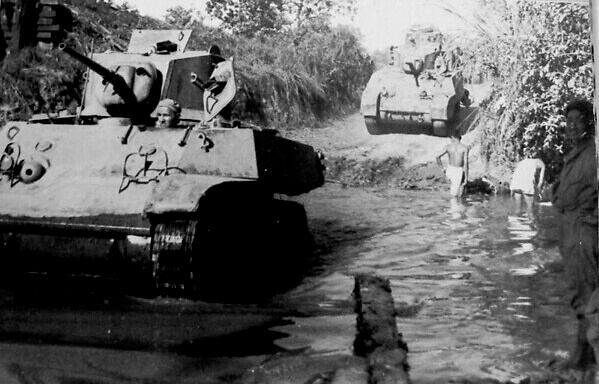 However, thanks to careful planning and the support of the specialist group of the United States 527th Ordnance Company (heavy maintenance) (tank), the battalion completed these difficult manoeuvres and reached Shingbwiyang in January 1944, where they awaited further orders. Stilwell was planning for a major battle at Mainkwang/Walawbum: The head-to-head assault on Mainkwang would be initiated by two regiments of the new 22nd Division (commanded by Liao Yiao-xiang), and the 5307th Composite Unit would carry out the long-range outflank with the support of 113th Regiment of the new 38th Division (commanded by Sun Li-jen). A blockade would be made when they reached Walawbum, making the 55th and 56th Regiments easy targets for allies force once they were pushed into this planned spot for encirclement. To make the head-to-head assault easier, Stilwell assigned the 1st Armored Battalion a crucial mission: tactical outflanking from the right side of the Japanese force in Mainkwang. The 5307th arrived at the outskirts of Walawbum on 3 March, and the 1st Armoured Battalion advanced from Taihpa Ga. The battalion was deployed as the 1st Battalion under the order of the 66th Regiment of the new 22nd Division; this hybrid task force was equipped with 248 vehicles, including 56 M3A3 Stuarts, 100+ CCKW 2½-ton cargo trunk and ¾-/¼-ton command trucks. This was the first time that the Republic of China Army utilised so many vehicles in one battle. 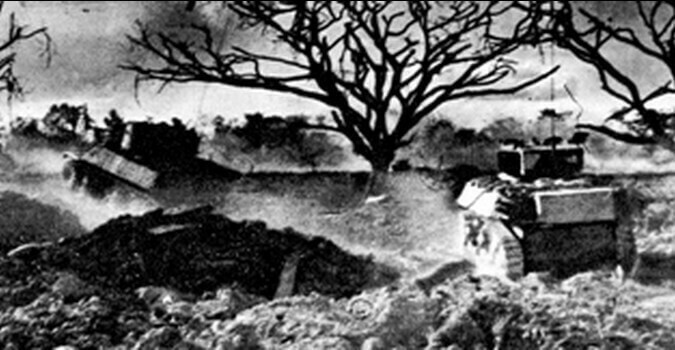 Due to difficult terrain, the advance was not easy, and this was complicated by Japanese attempts to hinder their advance by setting the jungle on fire. Enemy contact was reported as the battalion reached Tsama Ga, and enemy artillery frustrated the mechanised and armoured regiment. In the afternoon on 3 March, almost all of the 1st Armoured Battalion's hybrid task force was exposed to enemy bombardment, resulting in heavy personnel and vehicle losses. 17 tanks took damage and were temporarily out of action, returning to service the next day after repairs. 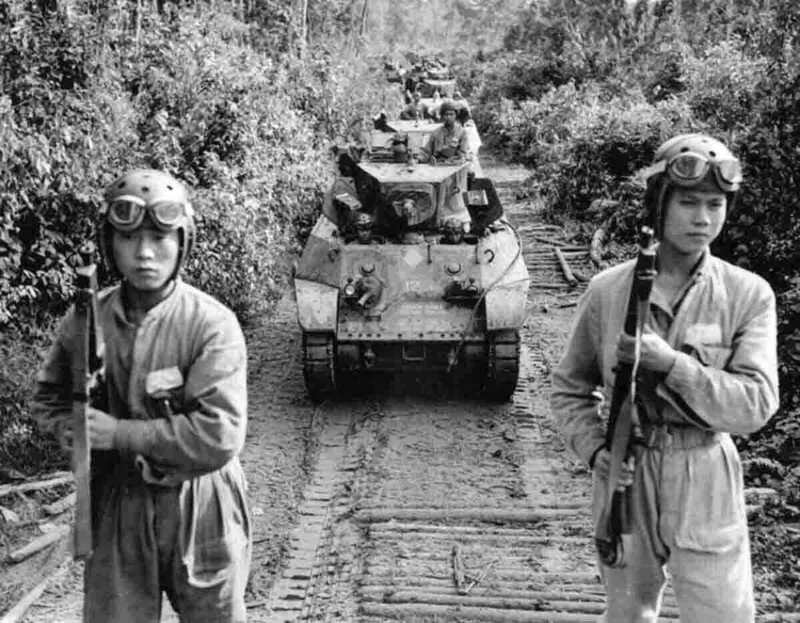 The manoeuvre of an armoured battalion in the jungle was an unorthodox tactic that caught the IJA’s 18th Division off-guard. As a result, the Japanese forces were unable to respond effectively. The task force dissolved Japanese resistance and advanced to Ninghku Ga, which sat beside Nambyu Hka and led the way to Walawbum. In the meantime, the fighting between the 22nd Division and the Japanese Army remained indecisive. As the 5307th arrived at Walawbum, they acted according to plan, dispatching one battalion to block the jungle highways while the main force attempted to occupy the height at the right bank of Numpyek Hka. The task force then encountered a fierce attack by the Japanese Army. Due to heavy casualties and ammunition shortages, the Americans were forced to retreat and the mission was taken over by the arriving 113th Regiment of the new 38th Division. The 22nd Division continued fighting the Japanese force in the vast jungle around Mainkwang, locked in a stalemate. At the bank of Nambyu Hka, the 1st Armoured Battalion was the only unit at the desirable spot for the attack on Walawbum. Colonel Zhao requested and obtained the acknowledgement of the armour commander Colonel Brown, and then decided to take the full-scale assault on 8 March. Colonel Zhao was bold in planning the assault on Walawbum: the 1st and 2nd Companies, led by Major Zhao, would cross Nambyu Hka from Yuga Ga and head for Walawbum, while the main attack by the 3rd Company, supported by an infantry battalion, would push eastward by across the stream from Kumnyen Ga. They then stormed to the centre of Walawbum through Kamain Highway. Using the larger force as a diversion, the armoured company would the Japanese by surprise. At noon on 8 March, the supporting force including the 1st and 2nd Armoured Companies started advancing from Yuga Ga, and the 3rd Armoured Company started to cross the river as previously planned. The strategic point was occupied by infantry units, followed by vehicles under the assistance of sappers. The 3rd Armoured Company immediately breached the outer defences, but their supporting infantry were too far behind to catch up. The tanks put down the Japanese AT guns and suicide units while taking losses and finally reached the centre of Walawbum. By this time, the forced that had conducted the feint manoeuvre had arrived, and the tanks easily drove away the Japanese troops. At sunset, the Japanese retreat from Walawbum was confirmed; the 1st Independent Armoured Battalion achieved a decisive victory. 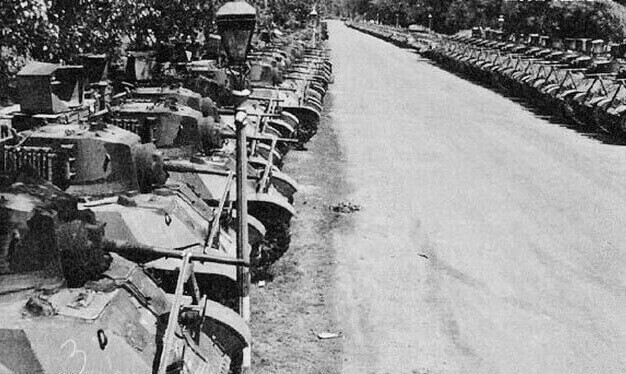 As most of the tanks in the 3rd Armoured Company had suffered damage and a shortage of fuel and munitions following the battle, Colonel Zhao ordered the 1st and 2nd Armoured Companies to return to the garrison and ordered an infantry company to cover the damaged tanks. He planned to clear the battlefield after daybreak with ample infantry support. The remaining Japanese forces launched several fierce counter-attacks at the allied force but were held off by superior firepower. Colonel Brown was dissatisfied with the decision to put tanks and an infantry company on the battlefield overnight, and thus argued with Colonel Zhao about it. Fortunately, however, the counter-attack caused few losses in terms of personnel and vehicles. In the morning on 9 March, the 1st Armoured Battalion, the new 22nd Division and the 113th Regiment of 38th Division entered Walawbum and took over the area. While mopping up the battlefield, the Allies discovered many valuable items, ranging from haphazardly-placed supplies to documents and orders of the IJA 18th Division, and even their official seal. The fact that this seal fell into Allied hands suggests that this battle destroyed the headquarters of the Japanese division. The Japanese could not carry on fighting and retreated through the jungle path, and so the Allies won the Battle of Mainkwang/Walawbum. The 1st Independent Armoured Battalion was relatively green. They had just received vehicles, equipment and armoured training from American lecturers in October 1943. Just two months later, they were sent into battle in Northern Burma. Despite being inadequately trained, the battalion was able to take the enemy forces by surprise. This is one of the few battles won with small armoured formations manoeuvring in difficult terrain during World War II. To memorialise its outstanding performance in Northern Burma, the Republic of China Army has named 3rd March (the first day of the 1st Independent Armored Battalion's action) as its “Armoured Forces Day".